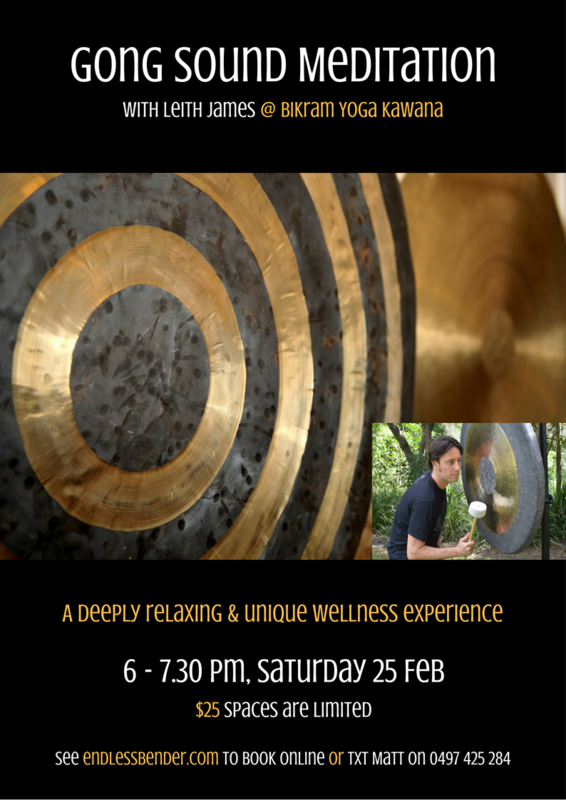 If you’re living on the Sunshine Coast, Australia or plan to visit sometime soon, then lock-in Sat 25th Feb. I’ve invited Leith James up from Brisbane to perform a Gong Sound Meditation for the yoga students at Bikram Yoga Kawana. Open to all, yogis, not-yet-yogis and non-yogis alike, please come along, lay back with a bunch of lovely souls and feel the gong. Sound healer. musician, and composer Leith James will use a range of ancient healing instruments including gongs, didgeridoo (yidaki), Himalayan & crystal singing bowls to help you relax your mind, body and soul through sound and music. The transformational qualities of gongs were known to ancient cultures as powerful therapeutic instruments. Sound meditation has been proven to ease the symptoms of depression and fatigue, as well as other conditions relating to lack of harmony in the body. Doors open 5:30pm for a 6pm start. Please arrive early so you can be seated on time before the proceedings start as no late attendees will be accepted. or txt Matt on 0497 425 284 to secure your place. For further information contact Matt Jermyn – matt@endlessbender.com | 0497 425 284.